Hormones are chemical messengers that are produced in specific parts of our bodies. One of the major functions of hormones is to help control when or how often our cells multiply and any changes can interrupt or interfere with this delicate process that in turn can lead to diseases such as cancer. Our cells take direction from our hormones which communicate to the cells what action to take. When these hormones reach unnaturally high levels, they increase the risk of some cancers by encouraging the cells to multiply more than they normally would. It’s no secret anymore that hormones are linked to the development of cancers that include prostate, testicular, breast and womb. Science does not yet understand why our bodies allow hormones to cause cancer but there are proactive steps you can take to keep your hormones balanced and reduce the risk of hormone related cancers. Smoking needs to be eliminated (there is no dancing around this subject…you need to stop if you value your long-term health). You should be diligent about avoiding excess secondhand smoke. This includes all smoke from cigarettes, pipes or cigars. This kind of smoke is known to contain 60 known carcinogens which work at interrupting normal cell growth and development. This interruption ignites cancer development. Diet; how often are you putting unnecessary chemicals and dead food into your body? Another factor that only you can control. Eat plenty of fruits and vegetables…they contain valuable antioxidants which help repair damaged cells. Dark green, bright orange and yellow fruits are your best bet when it comes to preventing cancer. Some dark fruits such as grapes and blueberries have also proven to have anti-cancer properties. Alcohol consumption needs to be checked and kept at a healthy minimum. Studies suggest that men that enjoy 2 alcoholic drinks per day and women that consume 1 alcoholic drink per day increase their risk factors for certain types of cancer. Physical activity comes into play whenever you mention the body and avoiding cancer is no different and activity is also within our personal control to change. Even the American Cancer Society recommends exercising at least 5 days a week for 30 minutes or more. Stay away from tanning beds and pay attention to any changes on your skin. Avoid too much UV ray exposure during mid-day sun. However be careful not to remove yourself from sunlight altogether as it is your best source of vitamin D.
Pay attention to your work environment. Are you being exposed to dangerous chemicals, fumes, or dust? There are a list of dangerous chemicals that can be found in work environments and you have a legal right to know what you are exposed to so don’t be shy about asking. 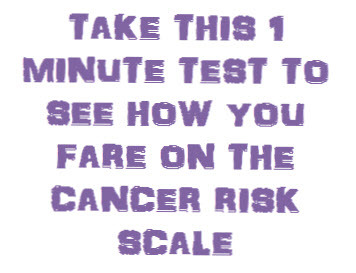 Experts across the board agree, 1/3 of all cancers can be prevented by improved lifestyles and you own the controls. And, that’s a good thing! 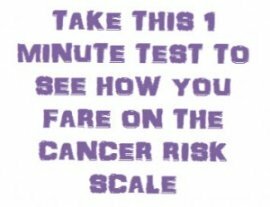 If you would like to know where you presently stand on the cancer risk scale take my 1 minute “Cancer Risk Test”… to see how you fare on the cancer risk scale.